Out of nowhere, a noise filled my head like a rushing wind: Pounding hooves. Shouts. War cries. The report of rifles. 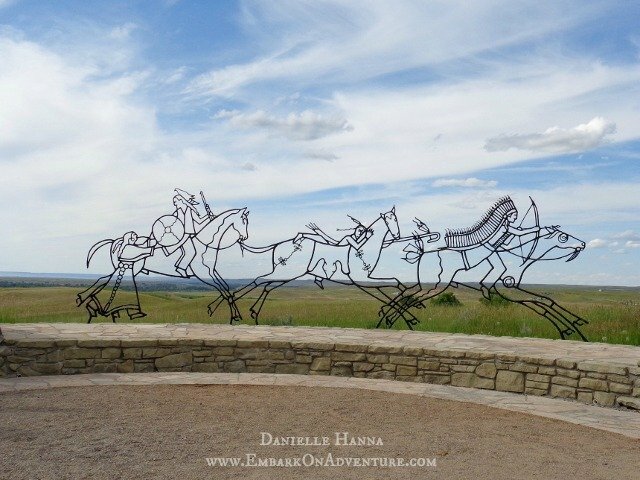 When these sounds crashed in on me, I was staring at a display of artifacts in the museum at the Little Bighorn Battlefield National Monument. It was as if these relics were whispering the story. As if all I had to do was pull back a curtain and suddenly find myself in the middle of the battle. 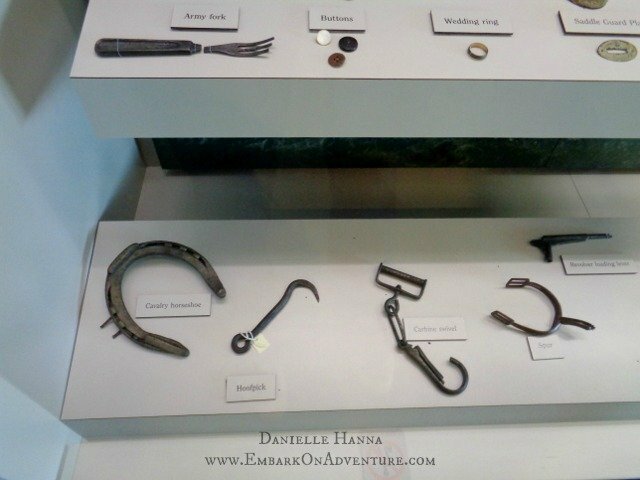 These artifacts had been there the day Custer and every man in five companies of the 7th Cavalry died, as well as an unknown number of Sioux and Cheyenne warriors. My brother and I (with Molly) made a trip to Billings last week. While we were in the area, we decided to see the battlefield. My brother had been there before, but this was the first time for me. I’d been told that many people found the battlefield to be a moving experience. They were right. 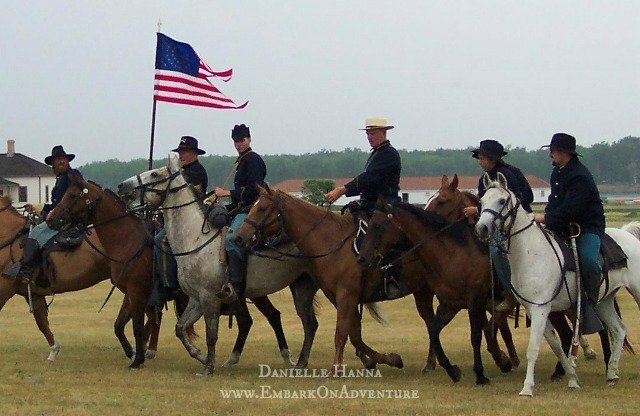 Maybe because the day I was there was June 24th — just one day before the 138th anniversary of the battle. Or perhaps because it had taken me twelve years to get there. 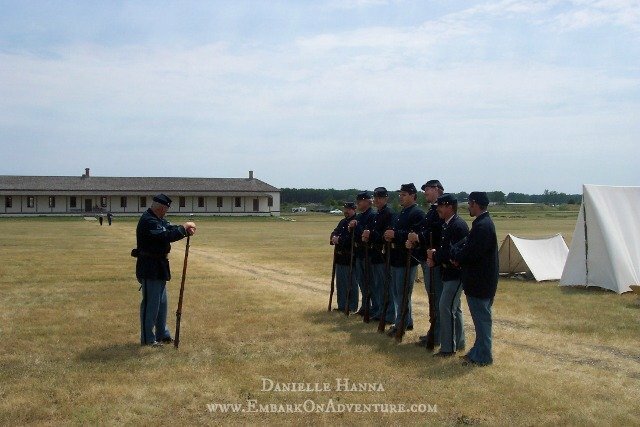 Twelve years ago, I first started participating in living history at Fort Abraham Lincoln, near Bismarck, North Dakota. Fort Lincoln was General Custer’s last command–and home, and has in many ways become my home. 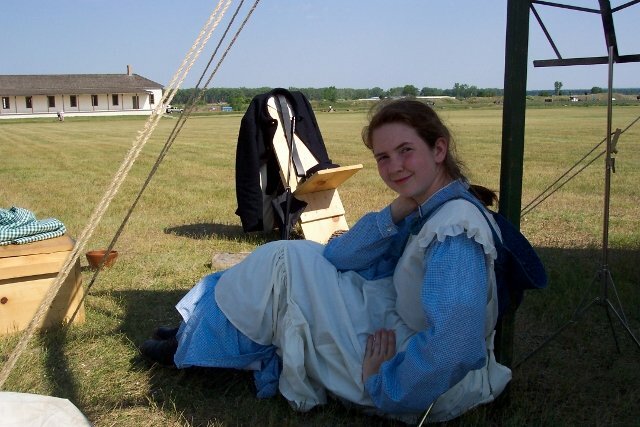 Me as a frontier army laundress at Fort Lincoln. 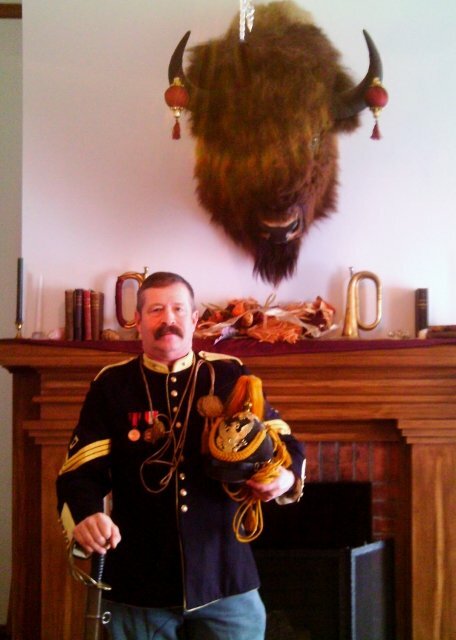 I didn’t join the laundress corps of the frontier army all those years ago because I was a die-hard Custer buff. I hardly knew anything about him. They just needed a couple of musicians, and my brother and I played fiddle and banjo. 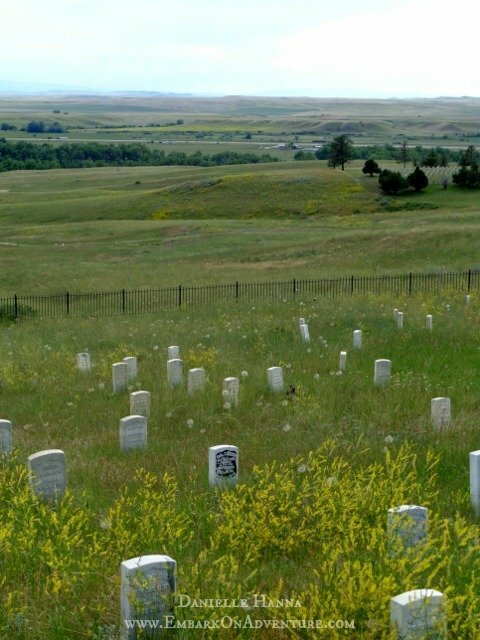 In between jigs and reels–and many encores of the General’s favorite, “Garryowen”–I gradually learned the Custer story. 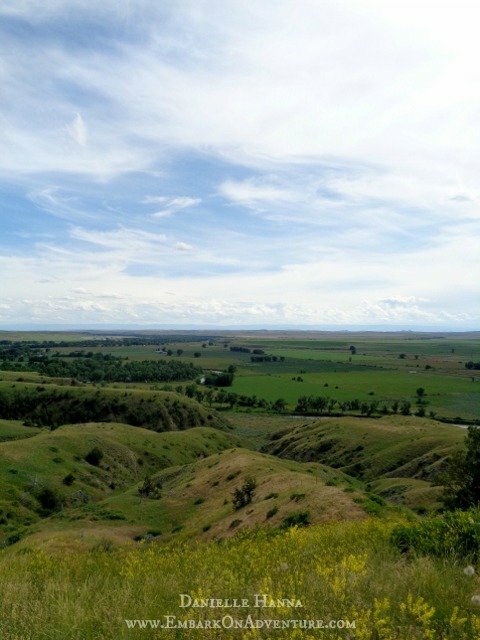 Montana claims fame as the place where Custer died, but North Dakota was the place where Custer lived. It’s become almost strange to me to realize that most people remember Custer for his death. 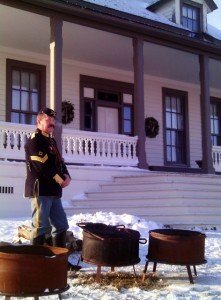 At Fort Lincoln, the year we portray is 1875. 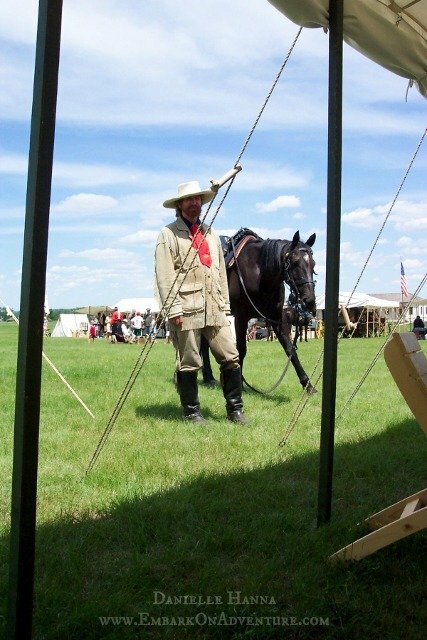 It’s always the summer before the Little Bighorn, and Custer is always there for our big events, portrayed by his modern-day twin Steve Alexander. 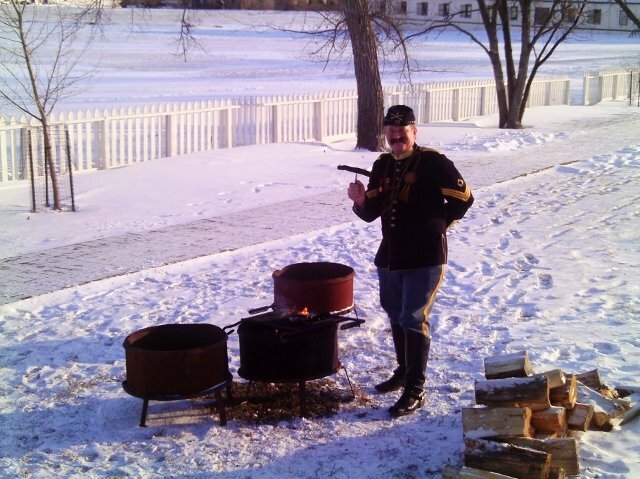 Every December 31st, Fort Lincoln resets the clock to 1875, and Custer cheats the battle once again. 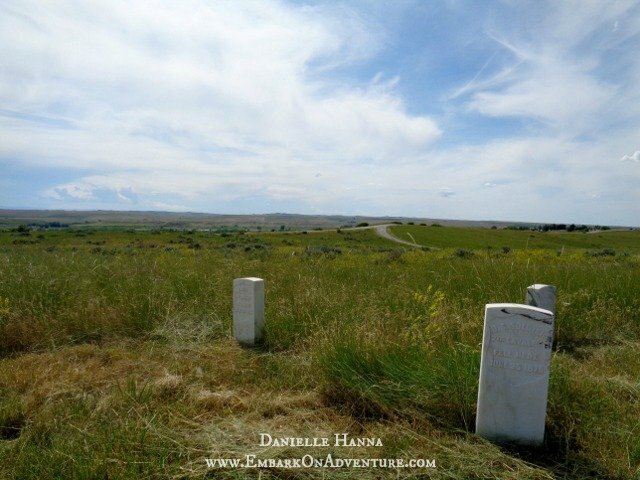 Maybe it was all those years knowing the living Custer–and all the living soldiers of the 7th Cavalry, like Captain Tom Custer, the most eligible bachelor in the 7th; and Captain Keogh the Irishman; and Captain Calhoun, whose wife played the harp–maybe knowing them almost personally for so many years is what made the Little Bighorn more than just a historic landmark for me. Who’s horse, I wondered, had lost that shoe? Was the rider thrown? Another soldier had lost his own shoe–a leather brogan shrunken and crumpled with age. Did he lose it retreating up the bluffs, away from the Little Bighorn? More than 130 years ago, a woman gave that ring to a man as a token of their love. Lost on a battlefield in the midst of a tragedy, it became a token of a woman’s broken heart. Now lover and beloved are both gone, and their ring sits in a museum, silently telling a story as moving as any Romeo and Juliet. My brother and Molly and I drove the four-and-a-half-mile road along the length of the battlefield. Contrary to popular belief, the entire 7th wasn’t annihilated. Custer divided his troops and attacked the Sioux and Cheyenne village on two fronts. Seven companies suffered great loss. But the other five that went with Custer were cut down to the last man. Here was the hill where Captain Calhoun died. 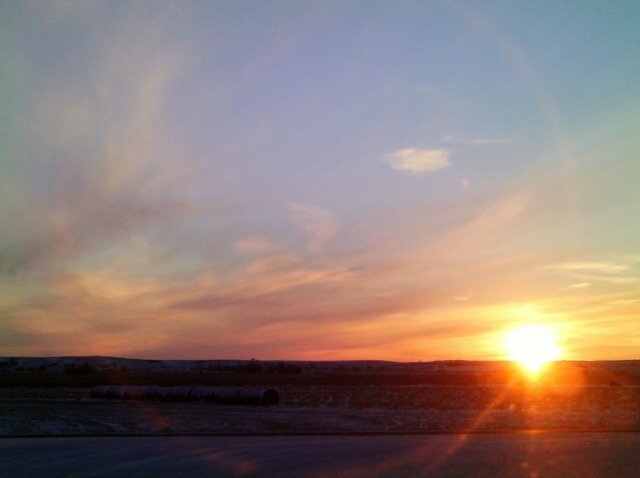 And there was the hill where Captain Keogh died–his horse Comanche the only living thing that survived the Last Stand. At the end of the road was the hill where Major Reno and Captain Benteen and the surviving seven companies withstood a siege for two days. 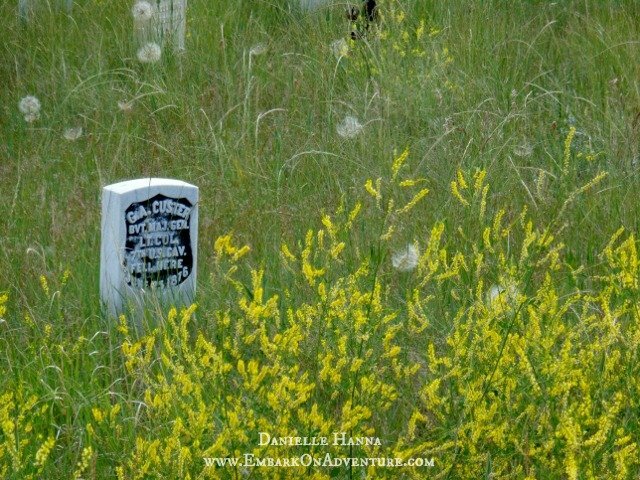 The entire battlefield was covered in stone markers, memorializing the very spot where every soldier died. 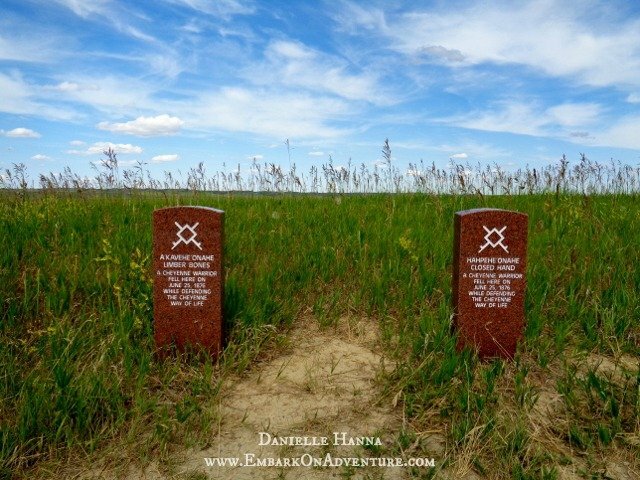 A few newer markers commemorated the places where known Sioux and Cheyenne warriors fell. Last Stand Hill was thick with white stones. Squarely in their midst stood one highlighted with black. 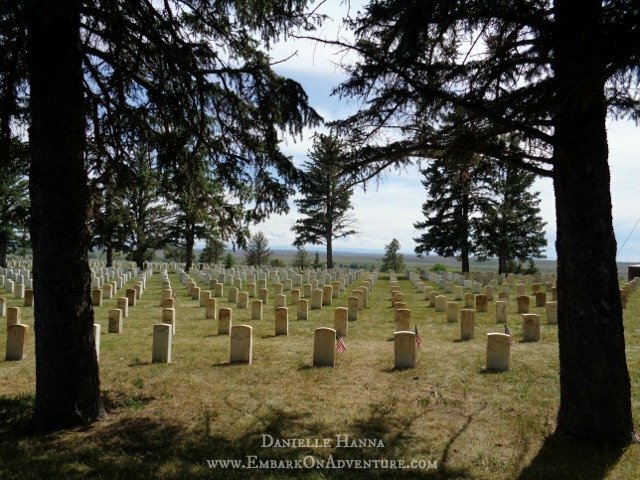 Here fell General George Armstrong Custer. 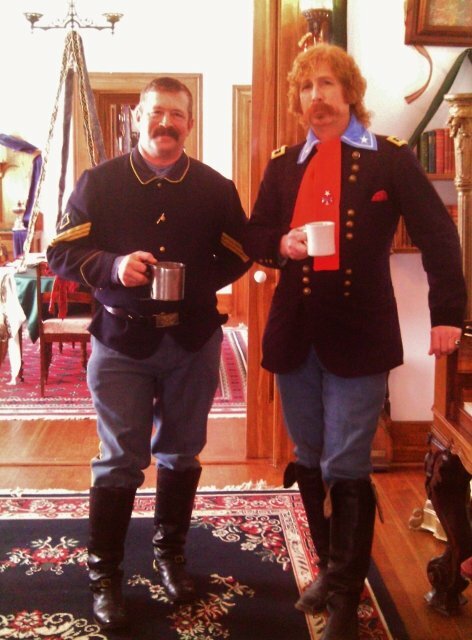 I don’t remember Custer for being a great Civil War hero. Nor as the controversial leader of men. I remember that he loved onions–and would eat them raw like apples. And I remember that he was never without one of his dogs at his side. And I remember that he and his wife used to slide down the banister instead of taking the stairs. I don’t dwell on the logistics of the battle, the blame-shoving, or even if one side was good and the other evil. All I see is a great tragedy in the Human Story. I hear the voices of children crying. I find women reaching for their lovers in the middle of the night and finding an empty bed. I hear a haunting Native wail for lost sons and brothers. Well, my most popular post so far, The Day I Drove a Patrol Car, is almost up to 100 views. And I’m ashamed to say how long it took me to remember another driving opportunity I had with emergency services. Yep. The day I drove an ambulance. 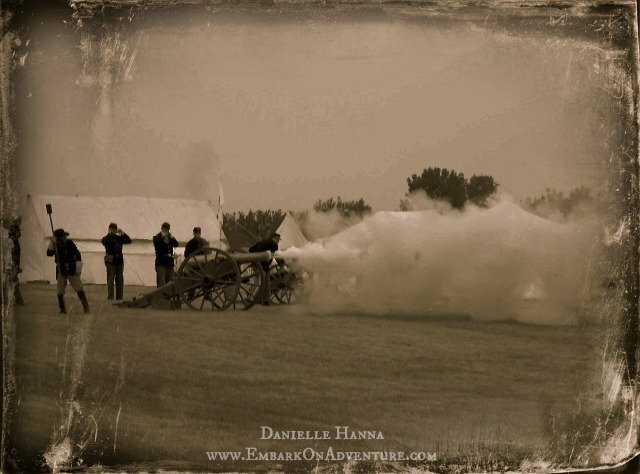 It was at Fort Abraham Lincoln, Dakota Territory, and the year was 1875. Or so a number of people running around in blue wool uniforms and calico dresses seemed to think, and since several of these people were carrying firearms and others were in possession of a cannon, I recommend you agree with whatever they tell ya. 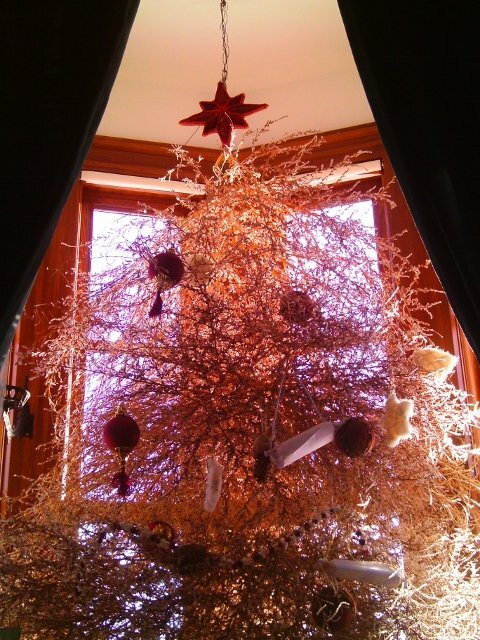 But it does have the best suspension you’ll find anywhere. Which, on rough prairie sod, means you’ll get your backside bruised as bad as if that ambulance had no suspension at all. I’m always baffled when I remember that this was one of the most comfortable forms of transportation in the West. The ambulance we use at Ft. Lincoln is mighty special. She saw service in the Civil War. That’s right. A real piece of history, bumping and swaying over our Parade Ground and giving rides to tourists. Heck, it’s an honor just to ride in it. Never mind I didn’t have a clue how to drive a team of horses. A pair of black and white Belgian/Percheron crosses named Muffin and Darby. “If you want,” I’d say. “The horses don’t start ’til the music starts,” he’d retort. In effect, I was the sole individual who had to pay for the privilege of riding the ambulance wagon. Maybe I had a bug under my bonnet (literally). We were sitting in the wagon, just Private Redding and me and another private, waiting for something to do. Private Redding had gotten off on another one of his long-winded tirades about something he couldn’t change (so he resorted to cussing it out, whatever it was). And when my mind is bored, it comes up with stupid ideas. And what the heck. Surely he owed me for all that banjo music. He showed me how and where to hold the reins and told me to plant my feet good and hard on the iron bar running in front of me. Despite the warning to hang on tight, the horses nearly dragged me right off the bench the moment they started. I thought the pulling action was supposed to go through the trace lines, not me!? I did all right, so long as I drove in a straight line. For some reason, turning gave me grief. I’d go all wrong, and when I tried to correct it, I’d go even worse. Fortunately, we were in the middle of the wide-open Parade Grounds and not on a road. But I never knew it was possible to almost run over one of your own horses if you took a corner too tight. Private Redding finally took the reins back from me. First Sergeant Johnson caught up with us later. 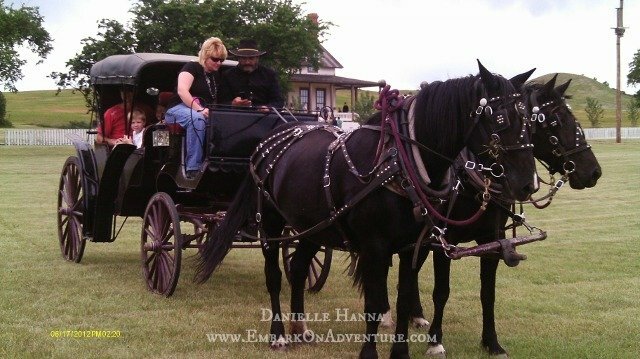 “Hey,” he said, beaming at me,” I saw you driving the wagon! 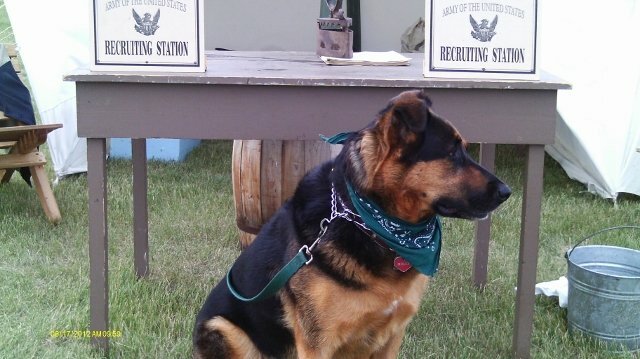 How’d she do?” he asked Private Redding. To my surprise, the next day Private Redding asked if I was going to drive again. I got in the driver’s seat. I finally got it right. That’s not to say I remembered any of his lessons the next summer. Or any summer after that. Don’t get me talking about the fancy black barouche. Different stories for different times. But I can say that I drove a genuine Civil War ambulance wagon. What experience am I still missing? Hmm. Anybody know where I can find a fire engine? I’ve been doing living history for twelve years, starting out in braids and a blue prairie dress. Someone even called me Laura Ingalls once. Appropriate, because my interest in history started with Little House on the Prairie, the TV show. 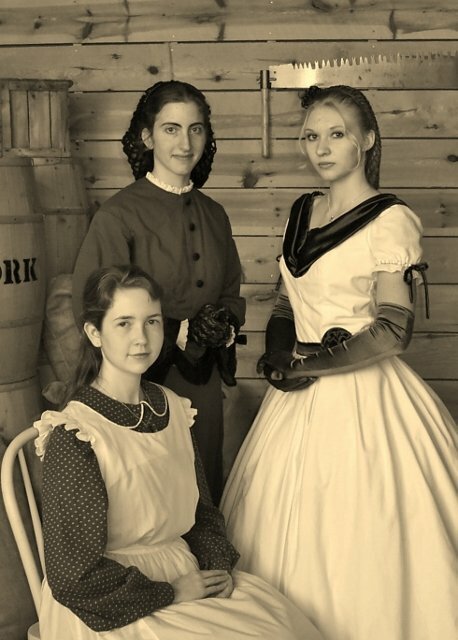 I used to watch Mary and Laura run around in their calico dresses and white petticoats, and I just knew one day I’d have calico dresses and white petticoats, too. Didn’t know what the heck I’d do with such a get-up. I just wanted one. Then came my banjo, then came Fort Abraham Lincoln State Park, which was looking for a musician, and the rest is … well, history. When I became a re-enactor, history suddenly leapt off the pages of my textbooks. I could feel a hard wooden yoke dig into my shoulders. I could lather up a bar of lye soap–slippery and frothy like modern soap, but smelling for all the world like some concoction made of fat and ashes. 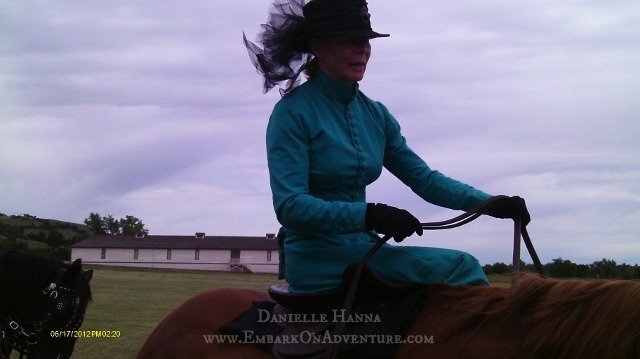 When I took off my dress at the end of the day, it exuded the aroma of sweat and dust and horse smell and campfire smoke. I’m pretty sure the history text books have a conspiracy going to convince kids that the past is as dry as a bleached bone. Living history shattered that lie. Long lists of names became real people. Dates became lifestyles. Historical events became life-altering circumstances. 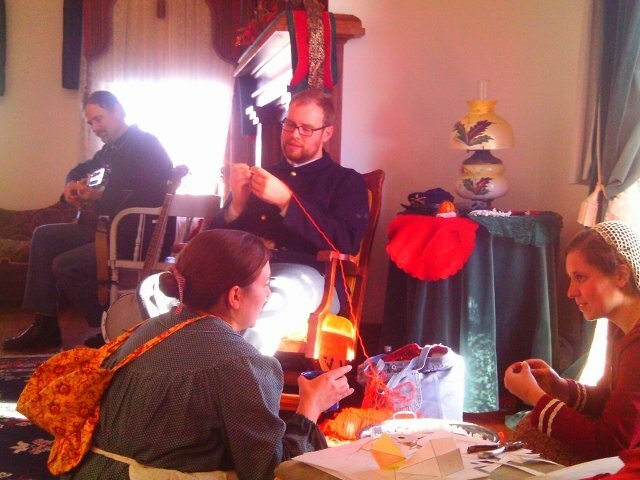 For a day, a weekend, a summer, I had gone back in time, and I realized that my own ancestors actually lived like this. Fast forward to a day last summer. I was asked to play at a dance at the Former Governor’s Mansion State Historic Site — a classic Victorian residence trimmed in shades of green. 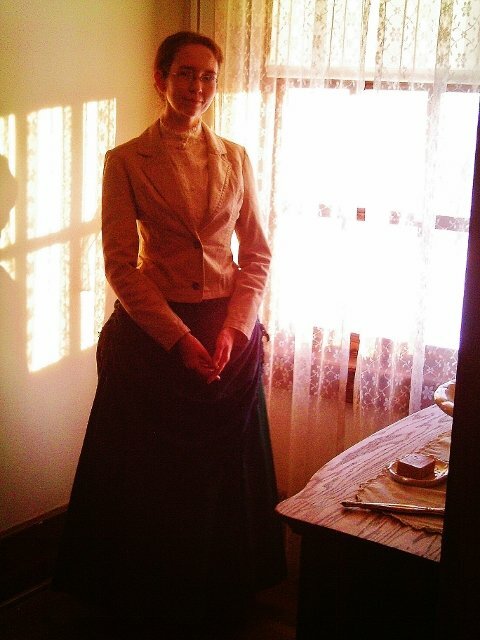 I arrived dressed as a young lady from turn-of-the-century frontier Bismarck. After the dance, there was a scavenger hunt for the kids. A group of little girls scattered all over the house in search of a dog-shaped coat hanger and a sketch of an Indian under a cupboard. They had so much fun, they started inventing their own games. Their favorite was counting the number of portraits in the house. They did it several times over to make sure they had the correct number. Then they took me on a round so I could verify it. We searched the house from top to bottom and came up with twenty. One for each governor who had been in residence at the mansion. When we had tallied the last portrait, we proceeded downstairs to assure the adults that the count was indeed accurate. The little girls tumbled down the stairs, and I followed at a more lady-like pace, as suited my long dress and stiff corset. At the landing half-way down, I stopped to look at one of the portraits, a stern-looking fellow in round glasses attempting a sort of smile, which was worn down after too many years spent as a politician. I had a connection to this portrait. 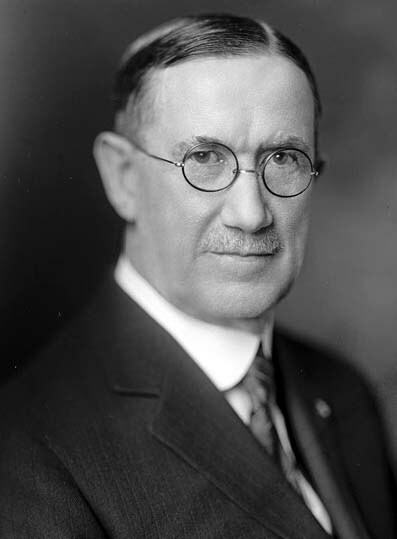 Governor L. B. Hanna. My great-grandfather. On a whim, I called the girls back. I remembered being their age and running around the house. All full of roped-off bedrooms and glass-cased pipes and top hats. At their age, I had never been able to wrap my mind around the fact that this house had ever been anything but a museum. That my own great-grandfather lived here, and it was his pipe and top hat in the glass case. “Do you see that man?” I asked the girls. They obediently looked up at the portrait. I also remembered being their age and staring at black-and-white photos of politicians in suits. The epitome of boring. Much more fun to look at the sketch of the Indian under the cupboard. “He was my great-grandfather,” I told them, “and he lived here a hundred years ago.” Exactly a hundred years ago. He was in office from 1913 to 1917. I didn’t expect my revelation to have any impact on the kids. When you’re that young, you understand what you can see and hear and explore with your hands. Not abstract concepts about people who died a million years ago. I don’t even know why I told them. I guess I hoped they’d make the connection. The gray-and-white guy in the suit was a real person. The girls stared at the portrait. Then they stared at me. Then they thundered down the stairs. That was a big moment for me as a re-enactor. My goal is to make history real to people. Kids especially. I want kids to fall in love with history, just like I did watching Little House on the Prairie. I want them to discover that history’s about more than memorizing dates and names. When I showed those girls my great-grandfather’s portrait, I saw the light dawn in their eyes. 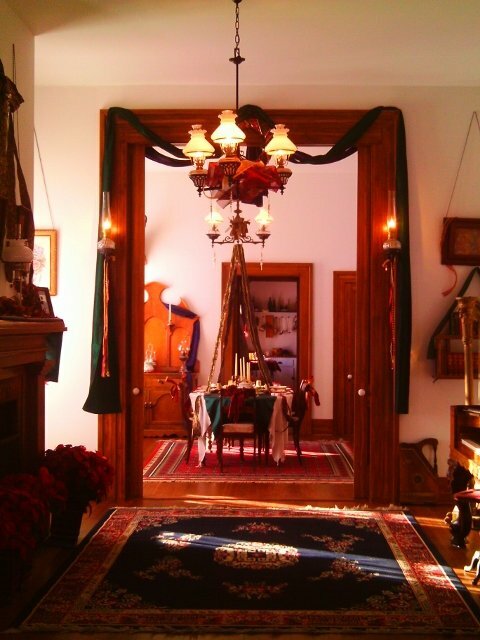 Real people lived real lives a hundred years ago, in old houses with wood floors and stained glass windows. Real people slept in those beds and wore those top hats and smoked those pipes. A real child, much like them, drew the sketch of the Indian under the cupboard. That was pretty much the culmination of twelve years re-enacting. Mission accomplished. Do you like reading? 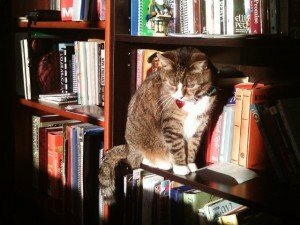 My human just added a new feature here at the blog. Now you can subscribe! Just go to the homepage and click the link at the upper right. Then you’ll get an email letting you know every time a new story goes live. Go on. Do it. You know better than to argue with a cat.